Turkish edition of the book written by Mustafa Çalışkan, Police Commissioner of Istanbul who went immediately to the one of the most critical points in Istanbul, Bosphorus Bridge as soon as informed about the traitorous insurrection carried out by FETO, published its eighth edition in a short period of time. Besides what Mustafa Çalışkan went through that night on Bosphorus Bridge, later renamed as 'July 15 Martyrs' Bridge' on which one of his close protection was martyred and the other wounded, the book contains significant information about before, during and after the insurrection. 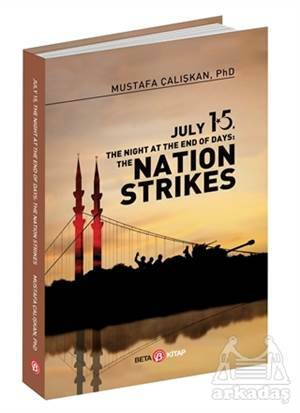 Çalışkan's meticulously written book "July 15 The Night at the End of Days, The Nation Strikes" in which some detailed information regarding the structure and history of FETO was also described is published in English too, in order the insurrection to be understood well by everyone. A reference book to identify and understand the foul relationship and sneaky games of those who try to understate the legendary July 15 resistance and try to make it forgotten. The truth about one of the most glorious resistance performed by the Turkish nation against putschists and traitors in its history revealed by one of the heroes of that night, Dr Mustafa Çalışkan who was at the forefront himself on that memorable night.